Sometimes one bad apple ruins the whole thing. One drop of taint makes the best things in life go bad. An this movie was full of potential taint. It could have been Minnie Driver (the weak point of "Good Will Hunting"). It could have been Dan Ackroyd (whose comedic routines can go from great in "Ghostbusters" to stupid in "Coneheads"). Or maybe it could even have been the fact the writers and director really have no prior experience in making a big film. But the potential taint never happened and this film came out almost flawless. Minnie Driver was given such a small role that her poor acting and unbelievable character (which, I guess isn't her fault) could be overlooked and placed in the margin. Not her worst performance, but not her best (which might be "Beautiful"). 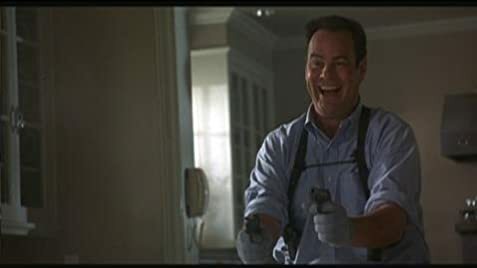 Dan Ackroyd was superb, actually presenting us one of the funnier yet darker villains in cinematic history. His delivery of Bible verses while shooting willy-nilly through a target's house? Diabolical! The directing was respectable and the writing was spot-on. Some great dialog between the characters and the story could not be beat. Seriously. The Cusacks? Oh my! John Cusack is a winner in everything he's ever done (besides maybe "One Crazy Summer"). This movie is one of his best, almost as memorable as "Say Anything" (though that one is flatly unbeatable). Joan Cusack was also pretty cool as a receptionist and her rapport with John is clear and shines in the film. I'm not buying a phone from her, though. And John's sparring with his kickboxing instructor? Those lessons have paid off! Jeremy Piven? Stupendous, as good if not better than his "Chasing Liberty" role. Having starred in 10 films with John Cusack, this is probably their best together. There are so many more praises I could heap on this movie, but I shouldn't have to. If you want to see a funny, quirky and well-crafted tale about a professional hit-man and a high school reunion, this is your film of choice. You might rent "Michelle and Romy", but not only will you not get the hit men, but you'll get a piece of dog doo, as well. So choose wisely. When Martin is trying to protect Debbie's father, Grocer can be heard downstairs reciting a passage from the Bible. It is from Revelation 13, "And they gave worship to the dragon, because he gave authority to the beast; and worshiping the beast, they said, Who is like the beast? and who is able to go to make war with him?" Debi: Some people say forgive and forget. Nah, I don't know. I say forget about forgiving and just accept. And... get the hell out of town. When DJ-ing, Debbie plays a Specials LP with the Two Tone Label on it. The song she played, Pressure Drop (originally done by Toots and the Maytals), never appeared on any Specials LPs on the Two Tone Label, but on an album released in 1996 called "Specials Today" on Chrysalis Records.